Our Goal is to improve the quality of your training leading to improved performance and reduced risk of injury. We incorporate principles from Yoga, Pilates and scientific research to build strong and supple spines capable of producing optimum performance. 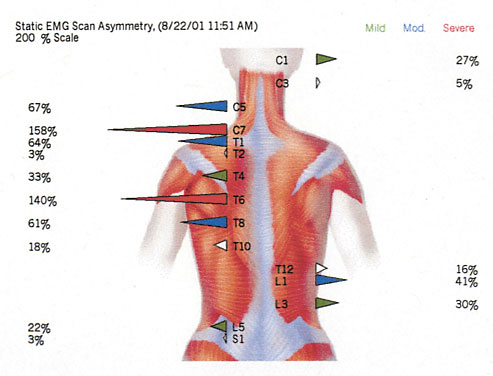 This scan of a patient’s muscle asymmetry depicts the amount of muscle pull from one side to another. Normal is marked by white spikes or no spikes at all. The same colors are used here – green, blue and red for mild, moderate and severe levels of muscle asymmetry respectively. Squat clinic – We can progress you from the basic squat to advanced performance including speed and power development. Functional Core stability – We can build your core stability from research proven exercises and we will also identify, modify and eliminate exercises that may be holding back your performance. Choose the best and take your performance to the next level.